Things have changed down here in the Florida Keys. Some things for the better, and a lot for the worse. Housing is expensive here in the Keys, and the tornados that followed the hurricane hammered some of the more affordable areas to live. Many people have moved, many are without homes; some are still living in trailers next to their home. 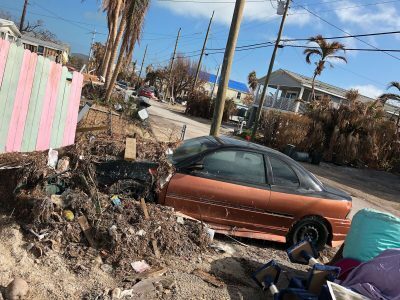 FEMA was minimal at best, insurance companies are looking out for their own interests, and unfortunately our local, state, and federal governments have not held up their end. So after months, our community decided that enough was enough! Locals began to start their own movements, and to clean up our home. In trying times it is ironically, when people seem to come together. The last time I personally witnessed this was 9/11. Something about tragedies bring out the best in people (mostly.) During the first days after Irma sure, people had to be on the defense, because there were people trying to take advantage. When residents were finally allowed back, people started uniting. When my husband and his uncle first arrived after a 30 hour drive (we evacuated to St Louis where my husband is from…and that is a whole other story) it took them 3 hours just to cut through to our driveway, and wouldn’t you know it, he got a flat tire while he was pulling in. Days went by and fatigue began to set in…and then the Costa Crew showed up. I was in Maine with my mom and my son. 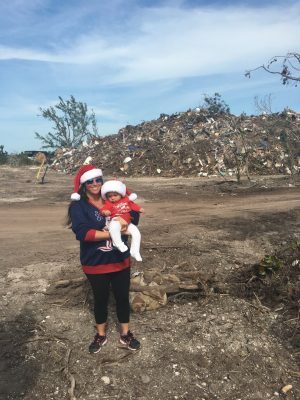 He was 7 months old at the time, so hurricane clean up was not something he could safely be around. Being away from my home was difficult. I wanted to be there to help, but I am a mother now, so I had to do what I could from afar. Never has social media been so crucial in my life. People would post what was needed for supplies, who needed help, and where volunteers should go. 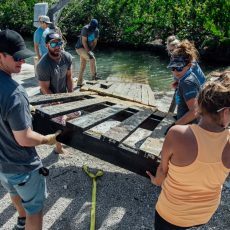 After seeing the work Costa did I knew the Foundation’s role needed to be to assist in the recovery and rebuilding of the Florida Keys. The amount of trash and debris was, and still is, disheartening. On Facebook I was seeing a lot of posts from women that had joined together to take in work orders for people and send whatever supplies and help they needed. 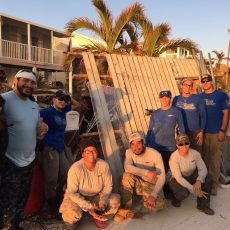 A gentleman who is also one of our Foundation recipients was in the leading role in organizing groups of veterans to come down and help. The Foundation funded their accommodations, and supplies that they needed. Since then Mote Marine Laboratory has generously let our groups stay at their dorms for a discounted rate. This keeps our Foundation’s cost down, and also keep in mind that any kind of housing is extremely limited. 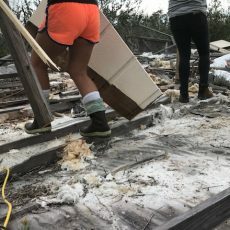 Of the 675 destroyed homes in unincorporated Monroe County, 465 were on Big Pine Key. 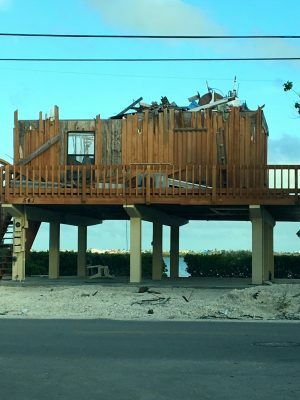 On Cudjoe Key 81 homes were destroyed. 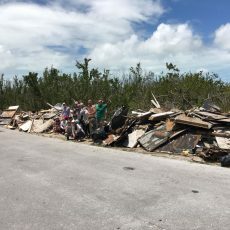 Houses were crushed from where we live in Summerland Key to just above Key West. This is the area where many of the homes that are donated to recipients of Foundation trips are located and where people who are a vital part of our tourism economy used to live. This initial clean up movement has continued. 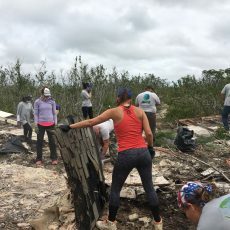 The Foundation has had over 35 individuals come down (most multiple times) and volunteer their time to clean up our community, and we continue to fund their accommodations at Mote. 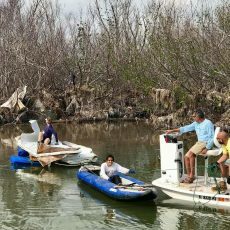 We have also donated product to a few of our superstar clean up leaders and volunteers with Costa, Yeti, and Shimano’s help. A big shout out to Lenore Baker, and Brian Vest. Lenore was a good friend to my father and one of the best humans I have ever met. 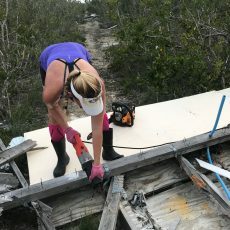 Tired of the excuses on why our home was not getting cleaned up she took things into her own hands. 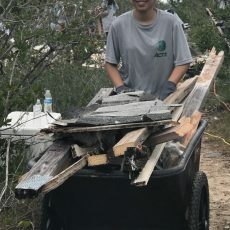 Every weekend since the November she and a group of volunteers clean up designated areas that need the most attention. At Christmas, in true Key’s spirit, some of the huge mounds of trash were decorated with lights! Board Member and long time family friend Terry Cassidy even wrote a Christmas song about it. It helped boost morale and sustain the momentum. When needed Lenore would request machinery that was needed to get the job done. Musician Howard Livingston donated a dump trailer to help her with her efforts. 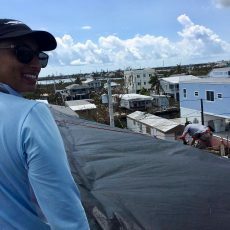 The Foundation looks to Lenore to help with what supplies are needed, and how many hands we need to get the job done. 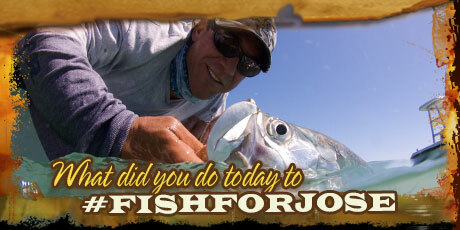 Brian Vest is focusing on our waters that we all know and love. FEMA has been working on clearing the canals, but only to a depth of up to 6 feet. They are required to remove debris that blocks the waterways to boats. Our canals are anywhere from 7-25 ft deep. 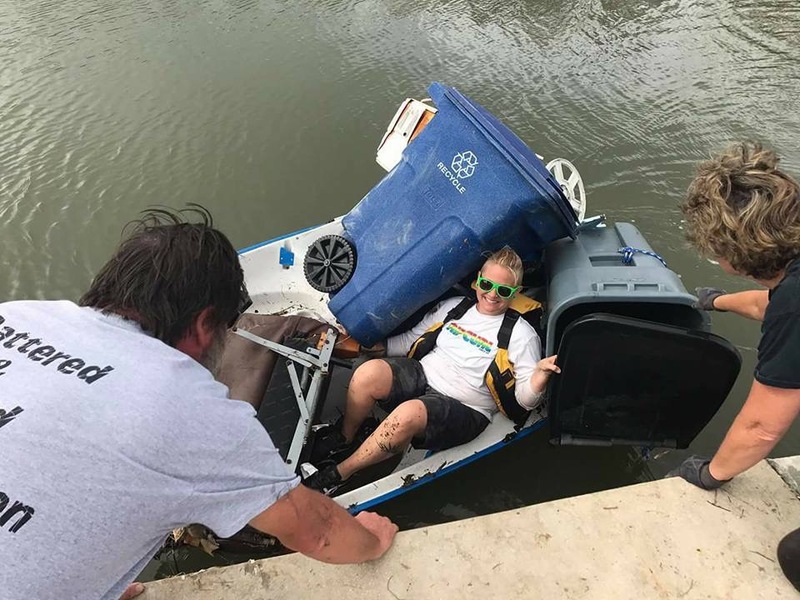 Brian has worked with companies to lend cranes and other equipment to pull things like port-a-potties, pool tables, jacuzzis, and other pieces of people’s lives out of the water. 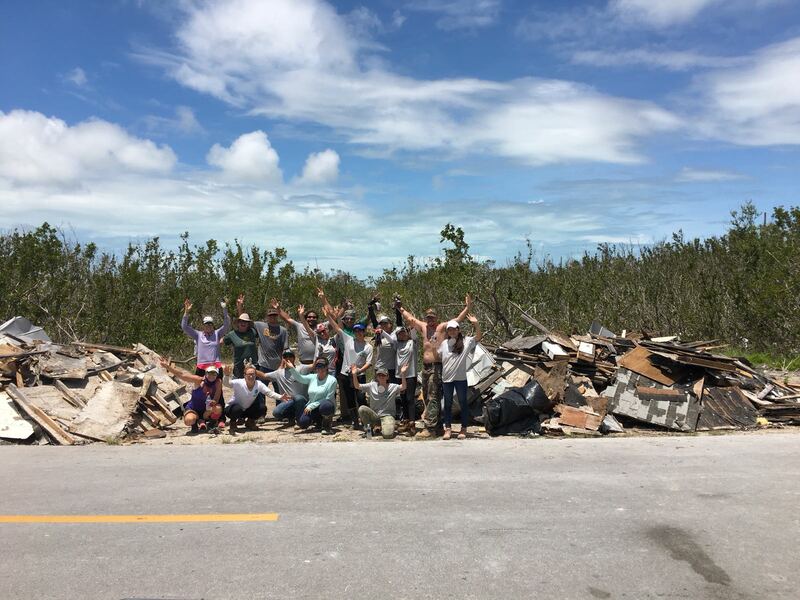 The Foundation has also begun to work with the Vineyard Church in Big Pine Key. They were the hub of everything after the storm. This was one of the few buildings that was not destroyed, or damaged in Big Pine. People could go there for supplies, food, work requests…everything you could need. Depending on the season the Vineyard has over 2,500 members. 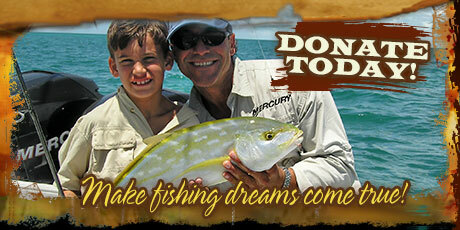 I reached out to see if we could join forces with them and have them help us identify who could benefit from a fishing trip. It was time to work on healing morale. Now here we are 7 months after the hurricane. US 1 is looking much better, but the land in the neighborhoods and along the coastline are still loaded with debris. People continue to struggle and for some the burden has been too much to bear. A few months ago a murder suicide occurred when the couple decided to take their own lives. The stresses of a disaster are real, and we want to help relieve some of those stresses. 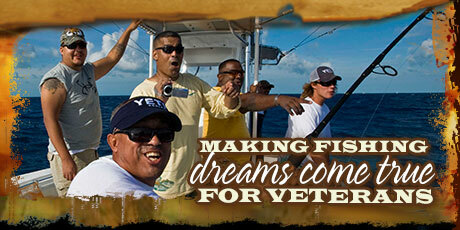 We make fishing dreams come true. 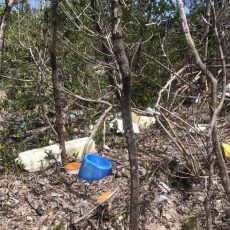 All the debris on land will eventually find its way into the water. 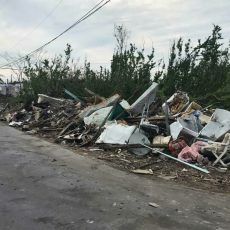 Our efforts will continue to help in housing, and supplies for volunteers that come through our Veteran Clean up crew leader and Act-2 Founder Edwin Vasco. 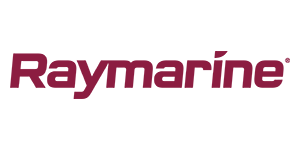 We are excited to work with the Vineyard to continue to take those out that have been heavily impacted by Irma. Keep in mind that one of the biggest reasons we live here is because of the water, and many people have lost their boats. 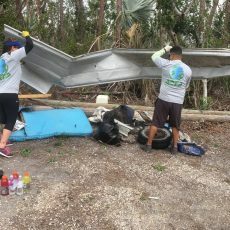 Clean ups will continue as will our pre-Irma partners Wesley House, Outdoor Dream Foundation, Make A Wish, and the VA Hospital of Miami. 50 ft of someone’s porch being removed from a canal. One day at a time, grateful to be here and determined to do our part.